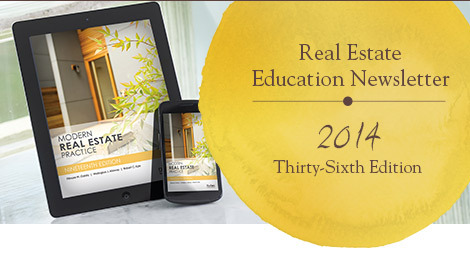 Just Released: Modern Real Estate Practice, 19th Edition Enhanced eBook! The Modern Real Estate Practice enhanced eBook contains all content from the textbook and also includes video clips, audio clips, and website resources. With this instantaneous delivery format, students can study anytime, anywhere. ARELLO and IDECC released new standards and policies and procedures. The new requirements go into effect on January 1, 2015. Dearborn has your school covered as you implement the new requirements. If you are an REcampus partner, stay tuned for additional communications in the coming weeks. What Becoming a DREI Will Do for You with Mark Barker, DREIThe Real Estate Educators Association is hosting a free webinar Tuesday, December 9, at 1:00pm ET. The new DREI mentor program is not only easier than you might think, it’s a step by step program with DREIs walking beside you all the way. As far as becoming a DREI, this webinar will spell out the Who, What, When and Why! Join the Mobile Movement in Education!